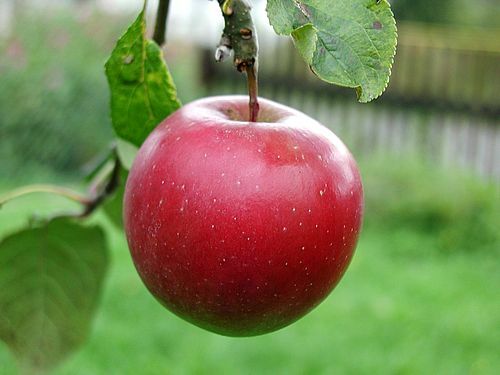 Ah, the humble apple, it's a pretty amazing fruit. It can be grown all over the place, it lasts for months, it has 8 bazillion varieties and it's one of the more chameleonic ingredients a cook can use. On a recent Saturday evening, what began as a craving for Guinness Stew turned into a spot of spontaneous cooking fun with apples! Kari and I had decided that we were going to go on a shopping trip to pick up the fixins for a hearty stew using beef and Guinness and a few more goodies. First we picked up leeks, carrots and Cortland apples at a Byward Market stall. Not even sure why we decided to buy apples... Maybe Kari can fill in the gaps in her comments. Next I suggested we pop in to the Sausage Kitchen on the Byward Market for the stewing beef, I'd been quite impressed by it in the past. While there, we caught notice of a product on special: Danish Bacon. I'd never tried it before so the nice fellow at the deli counter gave us a simple. It had a lovely delicate flavour, sort of a cross between back bacon and a subtle ham. So, buying a pound of the stuff was kind of a given. Once we had our ingredients, it was back home for food making! Now, as we were prepping the veggies, etc. for the stew, we were asking what to do with the apples we had. We decided a few chunks of apple in the stew would be a good idea, but then the juices started flowing. I asked aloud what it might taste like if we wrapped some chunks of apple in this heretofore unknown type of bacon and, oh, I dunno, deep fried them? Kari voiced her agreement and proposed one of her own: rice paper wraps with apple tossed in sesame and lots of other amazing flavours. Yeah, this happens a lot at our house. And so, we went ahead with making some lovely hors-d'oeuvres while letting the stew simmer away. Here they are! - 8-12 pieces of either back bacon or Danish bacon. If you insist on using regular bacon, I suggest cutting each piece in half. You don't need a lot of bacon to cover the pieces of apple. - Wrap each piece of apple with a piece of bacon and fix in place with a toothpick. Set aside. - Cook pieces of wrapped apple for about 3-4 minutes, until bacon crisps slightly (this kind of bacon doesn't crisp up the same way regular bacon does, so don't try too hard to make it crispy). - Remove from oil and blot on paper towels. Keep warm in 200 degree oven until ready to serve with Slavic Sweet and Sour Dipping Sauce. - Stir all ingredients together and serve. The other appetizer was Kari's inspired yet simple Apple Spring Rolls. Now, I'm sure you've all had the rice paper wrapped spring rolls at Vietnamese restaurants. Well, these were pretty much the same, but without meat and other ingredients. But they were remarkably tasty in all their simplicity. NOTE: Kari kinda made these up as she went, so these amounts are basically approximations of what amounts I think would work well. Rice wraps with peanut dipping sauce that solidified, so really, spicy peanut butter. - Stir dressing into filling ingredients and mix thoroughly. - Place 1/4 of filling mixture in a rice wrap and roll tightly. Repeat for remaining rice wraps. So much tastiness from our humble friend, the apple! The funny thing about this little culinary adventure? The stew kind of became an afterthought. We were both pretty full after the appetizer course and it's Guinness Stew, not exactly the most thrilling recipe ever. Tasty? Damn straight it was, but stew is stew is stew. I just don't find it all that thrilling from a "fun with cooking" point of view. Regardless, here's the recipe we used, plus we added a diced apple and a diced potato or two. Enjoy! This post might be a bit late for readers in Canada, but maybe it will come in handy for some of my American neighbours. October in Canada means Thanksgiving, which takes place on the second Monday of the month. Inevitably, there is turkey. Lots and lots of turkey... Poor little gobblers. Now, with turkey comes the age-old question of what to do with the carcass of the ex-bird after all that meat has been carved off. Most people I know make some sort of turkey soup after picking the meat clean. This year, I offered to take the massive bird corpse off my Dad and Step-mom's hands with the idea of making turkey stock (and really, turkey soup is pretty much turkey stock with a few added ingredients). What I ended up with was a lot more than I had imagined! Well, first up was making the stock. As you may have noticed, a lot of recipes call for chicken broth/stock. Personally, I've never been the biggest stock user, but that's been changing recently. I don't generally like using processed foods, so when I can get my hands on something authentic or make it myself, I will do so. Luckily, a local butcher sells stock by the litre, including chicken and duck stock (I don't remember if they do turkey). But it was fun to try making my own for once, and it was a rather easy process! This is a long process, requiring up to 24 hours. Basically, you break up the turkey carcass as best as possible, shove it all into a pot, add some veggies and seasoning, pour in a bunch of water and simmer it down! - Find the largest pot you have and set it on a large burner on the stove. Leave burner off. - Break down the turkey carcass into as many pieces as you can. Here's where you get to show off your inner barbarian and rip something apart with your bare hands (make sure they're cleaned or gloved)! Place all ingredients into the pot and fill with water until all ingredients are just covered by the water. - Bring to a boil, then reduce heat to low and simmer for 24 hours. About halfway through, you'll probably need to add more water. You are looking for a liquid, not a stew! - Run everything through a fine mesh strainer, draining all the liquid into one large receptacle, and putting the solid ingredients into a large bowl. - After washing your hands or putting on rubber gloves, sort through the solid ingredients to remove all bones and bone pieces (I saved mine for a Halloween costume, but the folks south of the border might not find much use for them!). - Let the stock sit for an hour or so, allowing a layer of fat to collect on the surface. It'll be easy to tell what's fat and what's stock since the stock will be a rich deep brown while the fat will be yellow. Skim the fat off the surface with a large spoon and discard (unless you have some secret use for turkey fat I don't know about). Stock is now ready to be used for whatever you want! Meat and stock can be stored in the fridge for up to two weeks, after that you'll want to freeze them. So, what you'll be left with is a lot of turkey stock and a lot of meat that has the tender string-like texture of unsauced pulled pork. The meat can be used in all kinds of recipes, but because it's meat that was already roasted and then boiled, it doesn't have a whole lot of flavour. But it'll hold sauce well and can be used to make all kinds of dishes, just make sure to add a lot of seasoning. Because of the similarity to pulled pork, I made a Cranberry BBQ Sauce and mixed it all together, heated in the oven and it was some pretty awesome sandwichery! So, hey, let's get a recipe for that! - In a small or medium saucepan, heat oil on medium-high and sauté garlic. - Add all ingredients except molasses, maple syrup and honey and bring to a boil. Stir sauce often. - Reduce heat to low and simmer for 20-30 minutes. Stir in molasses and maple syrup and simmer for another 5 mins. - Add honey and simmer for another 5 mins. Remove from heat. To make sandwiches, mix 3-4 tbsp of BBQ Sauce with about a half cup of meat in a saucepan and heat through. Add more sauce as needed. Serve on buns, bread, whatever and top how you like it. If you have some leftover stuffing and/or coleslaw, that would the perfect compliment! Kari also made a stew/chili using corn, potatoes, onion, garlic and arbol chillies, but she lost the recipe... Oh well! Basically, cook that stuff in a pot with meat and stock until it's what you want to eat. There, easiest recipe ever! So, with Thanksgiving coming up in the US and maybe some of you Canucks wondering what to do with the carcass in the freezer (if it's in the fridge, throw it out, the time has passed), well, now you know!